New content for the amazing world of Citadel: Forged With Fire that includes a deadly new enemy. The latest update features the Great Golem, a hulking goliath of animated stone and wood. This beast has been dormant in hibernation for hundreds of years and has awoken to become a major threat to careless Wizards and Warriors. Invade his personal space and you must make a quick choice to either run like hell or engage in combat - either way, it won’t be easy. Great Golems are high level creatures who pack a serious punch whether at distance or close range. Those who wish to take out these giants should stock up on healing items and bring their friends. It will be intense, it will be brutal, it will be exhausting, but it will be worth it! Upon defeating the Great Golem, successful adventurers will have earned a significant amount of valuable building resources including gold ore, precious stone and even light essence! Citadel: Forged With Fire is available now on Steam Early Access for $12.49 (a 50% discount) and is in development for PlayStation 4 and Xbox One,. 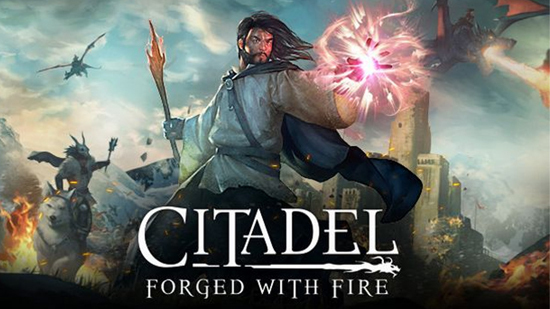 In addition to the latest update Citadel: Forged With Fire is currently on sale for $12.49 (a 50% discount) on Steam.